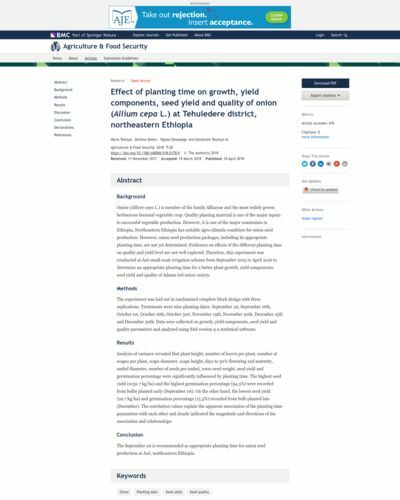 number of scapes per plant, scape diameter, scape height, days to 50% flowering and maturity, umbel diameter, number of seeds per umbel, 1000-seed weight, seed yield and germination percentage were significantly influenced by planting time. The highest seed yield (1032.7 kg/ha) and the highest germination percentage (94.3%) were recorded from bulbs planted early (September 1st). On the other hand, the lowest seed yield (29.7 kg/ha) and germination percentage (15.3%) recorded from bulb planted late (December). The correlation values explain the apparent association of the planting time parameters with each other and clearly indicated the magnitude and directions of the association and relationships.